American Standard wants to make sure you're completely satisfied with MARTIN'S and how well we took care of you and your needs. Soon after an installation or service call you will receive a letter requesting your participation in American Standard's customer satisfaction survey. This is the perfect way to communicate your thoughts and opinions about your recent installation or service call. Did we meet your expectations? Do you have any particular concerns you'd like to share? Your survey responses are forwarded to American Standard and to us. If there are any problems or special issues that need to be resolved, we assure you, they will be dealt with immediately. It will only take a moment of your time to help us be the best that we can be. There are several Customer Care Dealers in the Texoma area and many around the nation that care about their customers. But no one is dedicated to your needs like MARTIN’S. We were voted the top Customer Care Dealer in the whole nation. Wow, that’s a really big honor and we will keep on doing our very best to make you happy!
" Always prompt, courteous, and thoroughly knowledgeable. We will not use any other service company." 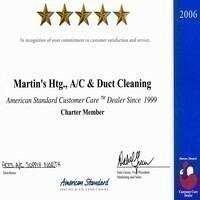 Andy H.
At MARTIN'S we care about you, your comfort, your health, and the air you breath. Nearly everything you do in your home can potentially generate indoor air pollutants. Indoor air pollution is one of the top five environmental risks to public health. Have you ever thought that your home could be making you sick. You don't want to breath nasty, dirty air every day, do you? The good news about indoor air pollution is, now you can take control and see how to get your air clean, with AirAdvice. The AirAdvice Monitor is installed almost anywhere in just minutes. This compact, multi-sensor moniter continually measures temperature, humidity, carbon dioxide, carbon monoxide, VOCs, and airborne particles. AirAdvice automatically generates personalized reports about the IAQ levels in your home. You can access these reports via the Internet. Also the knowledgeable technicians at MARTIN'S will make recommendations on how to improve the quality of your indoor air. To find out more about AirAdvice give MARTIN'S a call. We want to help. "Martin's is one of the best." Brian M.
"I didn't hesitate to call on them. They are very courteous, know their business and do a very good job. Peggy G.
You need a new air conditioner but you don’t think you can pay for it, and you really don’t want to take out a bank loan. Don’t worry, you don’t have to. At MARTIN’s we care enough about you and your needs that we offer financing through American General. Now you and your wallet don’t have to suffer. Have you been burn by other service company's before and you want to be extra cautious this time. You don’t have to look any farther. You can have a peace of mind that you will be treated with fair, honest, trustworthy service when you see this Customer Care Badge. We strive to make you happy, so you will continue to call us with all your heating and air conditioning needs. "They are very easy to work with and make every effort to insure we are happy with their service. We will use them again and would highly recommend them to anyone." Scott O. Good old fashioned service is hard to find these days but at MARTIN’S we listen to your needs and find fast affordable ways to fix your problems. You’ll be amazed how thorough we are, we strive for perfection in every little detail! Keeping you happy is what we want, because when your happy we're happy.So find out what it’s like to be one of our many satisfied customers. "I have complete trust in Martin's." Nancy H.
We believe that quality products and quality installation or service experience go hand in hand. The friendly staff at MARTIN'S will always treat you with the respect you deserve! MARTIN'S is a family owned business and when you become a customer you become part of the family. "Joe and Robert are completely competent and trustworthy." 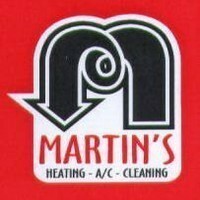 Ron W.
You can believe you will be taken care of the right way with MARTIN'S, because we really care!